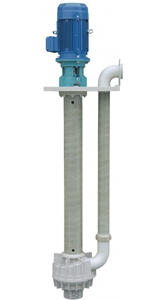 The KGK series are centrifugal pumps designed for vertical installations, with column and volute casing submerged, dedicated mechanical support, motor mounted above the liquid to be pumped, downward axial hydraulic suction, tangential and outlet connected to the vertical delivery pipe passing through the supplied base plate. Shaft of pumps longer than 2000 mm is supported with additional intermediate bearing. The G3 range generates semi-axial flow, has single or dual casing with one or two impellers in series.